Today is the last day you can get it, but ShopRite Shop From Home is offering $15 worth of free baked goods and/or fresh flowers when you spend $150. 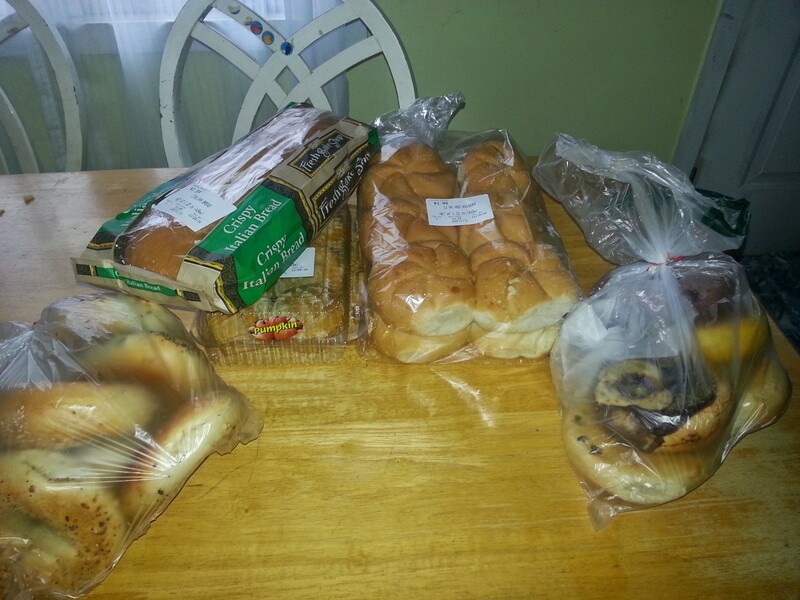 So along with my regular order, I got 12 assorted bagels, 6 pumpkin muffins, 12 Kaiser rolls, and a loaf of Italian bread for free! So I spent some time slicing the bagels and wrapping the halves individually, and individually wrapping the muffins. They all went right in the freezer, for future treats or maybe a holiday brunch. Hate to use all that wrapping, but that seems to help them keep well in the freezer, and allows us to have just a half a bagel. The bread we will have with tomorrow night’s spaghetti (and freeze the leftovers). The rolls, I will probably freeze half and use the other half this week for lunchtime sandwiches and for the pulled pork I was planning for Wednesday. No baking for me this week! And I’ve earned my free turkey, which I need to figure out what to do with.